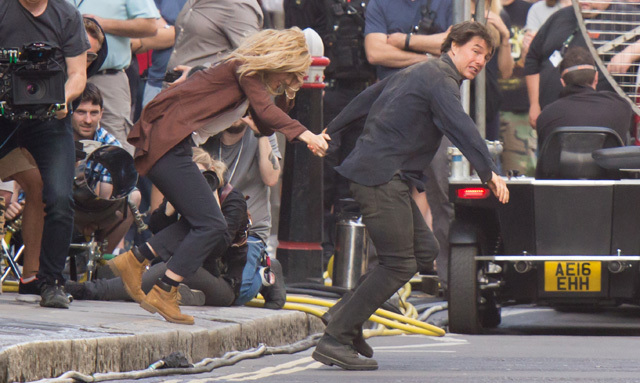 Tom Cruise and Annabelle Wallis make a break for safety in the final set photos for Universal’s reboot of The Mummy, now that principal photography has officially wrapped. Cruise and the Peaky Blinders actress were spotted filming last-minute scenes on the streets of London, running square in front of a giant fan. Is it possible that Sofia Boutella’s ancient deity will be whipping up a literal storm in the English capital? Time will tell. What we do know, however, is a general overview of the story fuelling Alex Kurtzman’s long-awaited franchise overhaul, as the filmmaker looks to unlock Universal’s world of gods and monsters. The Mummy is, of course, the first domino in a planned shared universe of creature features at Universal. Just last week, for instance, it was revealed that Javier Bardem was circling the title role in the studio’s Frankenstein movie. Kurtzman holds a producing credit on that film, while The Mummy currently boasts a cast that comprises Cruise and Wallis in lead roles, flanked by New Girl and Jurassic World‘s Jake Johnson, Marwan Kenzari, Courtney B. Vance and Russell Crowe as Dr. Jekyll/Mr. Hyde. The Mummy will hope to unleash mythical terror when Kurtzman’s modern redo is summoned into theaters in time for June 8, 2017.